An opener is an electro-mechanical device that uses a motor and a drive-system in order to make your garage door's operation automatic. Since it is quite complex, it can suffer from a variety of problems that can be quite difficult to repair. Installing an opener is no walk in the park, either, and we would advise any homeowner who's looking to get one to reach out to our experts for help. There are a lot of different manufacturers that dominate the industry in terms of quality and innovations. Genie and LiftMaster, for example, are renowned for their trademarked application of features such as rolling code technology, which prevents an opener's access codes from being exploited against its owner. Although the variety of models you can choose from is substantial, ultimately, these devices can be divided into three different categories, according to their type. Chain-drive openers are known for their strength and their affordability, however their noise output is very high, and they may not be a great choice for folks with a garage near a bedroom. Belt-drive models offer a similar method of operation, but one that is far smoother and quieter. They tend to be more expensive, though. Last but not least, there are the screw-drive units. A model of this type requires very little maintenance, as there are very few moving parts involved in its operation. While not as noisy as its chain-based counterpart, a screw-drive opener will be louder than a belt-drive one. As we mentioned before, due to its complexity, an opener can suffer from all sorts of malfunctions. But once again, our technicians have a great deal of experience taking care of all of them. We can replace worn out motor gears, repair circuitry issues and even realign safety sensors. Whatever it takes to make sure your unit returns to its proper condition, and that your door stays safe to use. Our team can help in various ways. Our experts will consult you on which model and brand are the ones best suited to your specific needs, and we'll perform the opener installation once you've made an informed choice. Beyond that, if you ever encounter any type of problem, you'll be able to count on us to fix it. 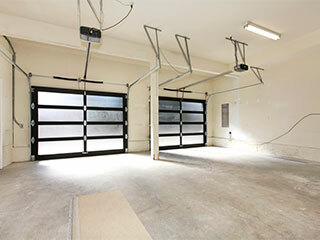 Call Garage Door Repair Scarsdale today.